(1 Customer Reviews) | Write Review 12 issues per year Your Cat is the must-have magazine for all cat lovers and owners – every issue is packed with information you need to keep your cat happy, safe and healthy. In the Cat Care section, the Your Cat panel of experts provide advice and answers to queries from readers on crucial health, behavioural, grooming, veterinary and nutrition issues. There is also an extended kitten section, with reader diaries, advice on choosing the right kitten for you and gorgeous pictures in the kitten gallery. 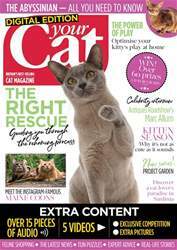 As well as practical content, Your Cat also delivers entertaining features, celebrity interviews, real life reader stories and fictional exclusives from leading authors. 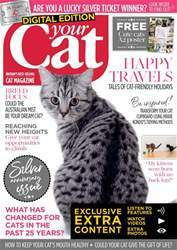 If you love cats, you’ll love this – the perfect magazine for you and your feline friend to enjoy together. Looking for Your Cat in print? Unfortunately pocketmags.com does not sell print copies of Your Cat, but all is not lost. Our partner at magazine.co.uk sells print subscriptions at the best prices online. Wow — this year is really flying by! 2017 still feels like five minutes ago, and now 2019 is almost upon us — but at least this year’s beautiful, long summer brought with it plenty of opportunities to enjoy the sunshine, for us and our felines! It’s hard to believe that some people just don’t like cats, but this issue we chat with a lady who was very wary of them for many years until she started to realise that she had been wrong about our furry friends all along! Turn to page 20 to read about how beautiful Ragdoll Cece has lit up Steph’s world. Another cat who has managed to provide light in the darkness is black and white moggy Arthur, who was recently awarded the Most Caring Cat at the National Cat Awards 2018. On page 26, you can hear all about how he gives owner Emily the motivation to be the best she can be. It’s truly amazing how animals can completely turn people’s lives around. A few of my other favourite features are our photo feature on page 6, which showcases an incredible close-up of a lioness in her natural habitat; our new ‘Lost & found’ series, which will follow different owners each month as they are reunited with their missing pets; and, as we honour those who have sacrificed themselves during times of conflict this November, we look at how cats have been essential to war work on and behind the front line for thousands of years. The most magical time of the year will be upon us before we know it, so this month we’re helping you put the wheels in motion and get ahead of the game for Christmas. On page 48, you’ll find Battersea’s top tips for hazards to look out for over the festive period and, in our shopping pages, you’ll find a few gift ideas to get the festive juices flowing. 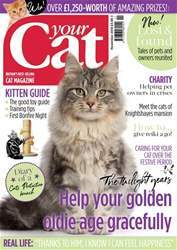 Your Cat is the must-have magazine for all cat lovers and owners – every issue is packed with information you need to keep your cat happy, safe and healthy. You'll receive 12 issues during a 1 year Your Cat magazine subscription. What is not to love about this magazine. If I can get it away from my two little girls!! 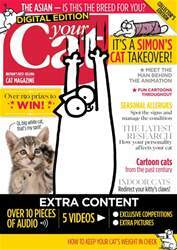 You'll receive 12 issues during a 1 year Your Cat magazine print subscription.